We’ve had a debate recently about whether to get cheaper Wonderbread-type bread or more expensive, more textured bread. There’s no nutritional benefit to the more expensive bread, and if our kids grow up preferring the cheap kind they’ll lose nothing except status in the eyes of people who consider it low-class. I’d prefer to get incandescent Christmas tree lights because the color of the light looks right to me, but they’re less durable, take more electricity, and are getting harder to find than the LED lights. So I’ve grudgingly decided not to raise my kids to prefer an outdated product they probably won’t even be able to buy. I like our house to look nice, but I also worry that this isn’t a very productive thing to spend time and money on and is just contributing to everyone feeling they have to make their houses look a certain way so other people will accept them as grown-ups. This entry was posted in Uncategorized and tagged money on February 19, 2017 by Julia. I’m careful not to say I can’t afford things, because I have a pretty well-paid job and my husband has a very well-paid job. A lot of our friends are doing low-paid nonprofit work, grad school, etc. and have much lower incomes than ours. Most of the things people talk about not affording are not literally things they can’t afford. When we say we can’t afford something, we usually mean, “There’s something else I would rather spend that money on.” Which is a perfectly reasonable choice to make. Jeff and I are almost the only ones in his family that don’t vacation in Italy, which is weird because we can “afford” more than the electrician and the schoolteacher, but we choose not to. Half our money goes to charity, and the rest goes to taxes, raising our kid, and buying a house. There’s not a lot of spending money left over, and that’s fine, because we chose all of this. But it still makes it awkward to go out with friends and be the cheapest ones there, or to turn down invitations to do things with them that cost money. When I was first hired at that charity, I told them I didn’t want their 401(k) contributions because I wanted them to keep the money. The woman from HR raised her eyebrows and asked if I was independently wealthy. I was pretty upset at the idea that she didn’t believe I would donate to the charity unless I had more money than I knew what to do with. But that was her idea of who could “afford” to pass up the $400 or so that they were going to give me. I don’t mean any of this as a complaint. I’m very lucky to have what I have. I’m just noticing the way the concept of “affording” is not always the same thing, and how that leads to strange situations. A similar thing happens with having “not enough time” to do something—we usually mean a budgeting choice, rather than an actual impossibility. The self-described poor man’s philanthropist, he gave away more than $150,000 over the past 33 years, mostly in thousand-dollar checks, to people he read about in the Richmond Times-Dispatch who were experiencing hard times or who had been unusually kind or courageous. . . . This entry was posted in Uncategorized and tagged money on February 6, 2015 by Julia. How much does it cost to raise kids? If you try to find out how expensive it is to raise a child, you see lots of different figures. The Wall Street Journal thinks it costs $47k a year. The FDA calculator thinks it’s more like $13k a year. Early-retirement gurus like Mr. Money Moustache think it costs virtually nothing. How is that last category coming up with their numbers? I can see two sides to this – if you have at least one stay-at-home parent, live in a cheap area, and generally reduce expenses, yes, I agree, raising children doesn’t have to be expensive. People all over the world do it for a lot less than Americans spend. Even American spending varies wildly by income level. Higher-income families spend over twice as much as lower-income families. Let’s say we wanted to be a one-income household with a young child. How would we manage? – One stay-at-home parent means virtually no childcare costs. – Health care (insurance, copays) for all three of us might be $3k. – A two-bedroom apartment in Cambridge, MA with utilities might be $21.5k a year. – Spending money (clothes, vacations, cell phones, entertainment): $5k a year. – Groceries: $200/month; $2.4k a year. That would put our expenses around $38,000 a year. I used to earn $33,000 as an administrative assistant, so this would be doable if you could earn a little more. If we earned less than this, we’d probably move to somewhere cheaper than Cambridge. Of course, this isn’t what we actually do. For one thing, we don’t reduce expenses as much as we could. The Boston area is expensive, but we like it. We like living near Jeff’s family. We like the public transit system. We like the thriving folk dance community. We like being near great universities and the people they attract. And while we could live more cheaply in another city or a rural area, we think the benefits of this environment and community outweigh the costs. Also, we use money for more than just establishing our own quality of life. We value our family a lot and we prioritize ourselves financially, but not to the expense of all else. Specifically, we donate a good chunk of our income (50% this year) to the best charities we can find. That’s possible because we have two incomes. I can see the appeal of retiring early, working part-time, or having a stay-at-home parent. But I also value other people’s children, and this year we expect to save about 20 people’s lives from malaria. To me, that’s totally worth it. As for the question of how much it will cost to raise our child: Jeff and I write down everything we spend, so I’ll let you know after the first year. 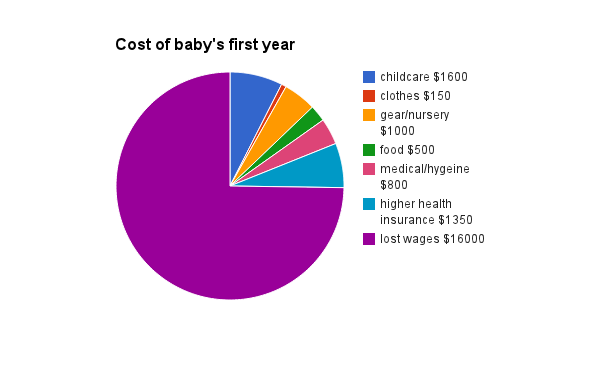 Update: what we spent in the first year. This entry was posted in Uncategorized and tagged children, money on November 24, 2013 by Julia. I notice this frustration. Long-term goods like houses would ideally be bought early on so you can enjoy them as long as possible. But young people don’t have the money to buy a house they want to live in for a long time. One traditional solution is for older people to give durable goods to young people. But the incentives aren’t the same as for something you buy yourself: young people are notoriously bad at caring for, say, cars that daddy bought. I’m realizing that I ought to change my spending patterns based on this. I currently buy a mix of short-term pleasures (food, flowers, clothes that I probably won’t like forever) and long-term ones (furniture, a sewing machine, books). I would do better to prioritize long-term goods now so I’ll have them for longer, and later buy more short-term goods. I’ll enjoy chocolate the same whether I have it now or in 40 years, but a banjo gets more use the longer I have it. This entry was posted in Uncategorized and tagged money on April 5, 2013 by Julia.